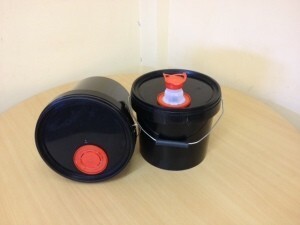 Our latest product, the 5L Black Plastic Bucket with Pull Out Spout is a testament to the H&O ethos of customer service. This new container was created when one of our trusted customers came to us with a problem that was seriously inhibiting their operations. Their previous plastics supplier was charging too much for a specialist item. They came to us looking for a fast and cost effective solution. As a specialist plastics manufacturer, we were able to offer them a more affordable price without compromising on quality. We quickly altered the design of one of our existing Tamper Evident containers by inserting a retractable folding spout into the bucket lid. This product was tailor made for the client. The flexible spout was designed so workers could pour harmful liquids more easily. And because the spout is retractable it means they can be stacked to make the best possible use of the available space. By manufacturing and selling buckets directly to our customers we are able to work more closely with clients of all sizes to deliver exactly what they need at the best possible price. This isn’t the first time we’ve bent over backwards to meet our customer’s needs. When one of our long-term customers needed greater brand recognition we were able to accommodate by creating an orange bucket with a black lid, matching their company colour scheme. More recently we have helped companies who wanted their logos or other pictures printed on buckets. Other customer requests we receive relate to how difficult it should be to open a container. Some of our customers who transport hazardous products need container lids to stay tightly sealed for the extent of a journey. Other clients, on the other hand, need a lid to open and close quickly a number of times a day. We work hard to make sure all of our products are tailored to suit specific needs of our customers.